Ajax Cape Town have decided they will play in the African Confederation Cup this weekend after all - after two days of negotiation with the South African Football Association (Safa) persuaded them to go ahead with a potentially scary trip to Angola. The club announced their intention to withdraw last Friday because of concern over internal travel arrangements in Angola, where they are to meet Sagrada Esperanca in their first round, first leg tie in the mining town of Dundo on Saturday. Ajax claimed they were worried about safety, they could not obtain insurance for their players and had been frustrated over their arrangements by the Angolans. But they will now go ahead with the game after officials went to Johannesburg to meet with Safa, who did not want them to withdraw. "After a fruitful meeting between the representatives of Safa and Ajax Cape Town held on Monday, Ajax agreed to withdraw their decision of not playing the Caf Confederation Cup match against Sagrada Esperanca on Saturday," the club said in a statement. "(This was) subject to Safa providing Ajax with all the information which was previously requested, which included full details of the aircraft to be used to transport the team internally and a full detailed itinerary during the stay in Angola. "Although the itinerary for the trip is still outstanding and therefore we are not aware of departure or arrival times, hotel reservations etc., Ajax has decided to fulfil the fixture as at this point in time, Safa have provided the club with the necessary information to appease the club with regards to the safety of the players and travelling staff." Visiting teams do not have to take bus trips longer than 200km in Caf competitions and so it is likely Ajax would have to fly from Luanda to Dundo, usually a two-hour flight. The South African club revealed it has been unable to obtain insurance for their trip to Dundo, which is some 1120km north east from the Angolan capital Luanda, because they do not know on which airline they will travel. Confederation of African Football rules state that internal domestic travel is the responsibility of the host association but repeated attempts by Ajax to find out how they will travel between Luanda and Dundo have produced no information. "All they told us was 'get yourselves to Luanda and we'll sort out the rest'. 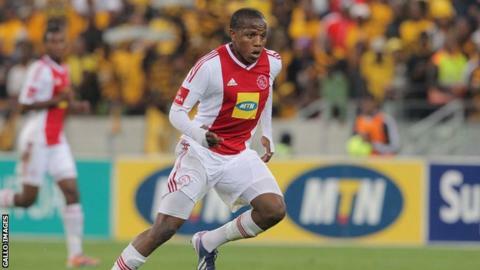 But we want to know more precise detail than that," said Ajax coach Roger de Sa last week. "We don't know if we are on a IATA-affiliated airline, because if not we have no insurance. "We don't know where they are taking us and how much time they will force us to be in a bus. We have sent e-mail after e-mail but got no satisfactory response," he told BBC Sport. Late withdrawals by clubs from Caf competition automatically invoke a three year ban and Safa did not want Ajax to jeopardise South Africa continuing to have two teams entered in each of the two annual African club competitions. Safa will send a representative along with Ajax, whose 22-man party leaves via Namibia on Friday.